Earlier today I had a discussion with a person who described himself a "skeptic", not a denier concerning scientific consensus on ACC. His stance was that there is no consensus among climate scientists that the current climate change was due to human causes. Of course, I directed them to Anderegg 2010, Doran 2009 and Oreskes 2004; but he kept coming back with the statement, "there are climate scientists who do not believe there is a consensus among climate scientists". I kept trying to explain that yes, there are climate scientists that disagree with the consensus, but not that there is no consensus. 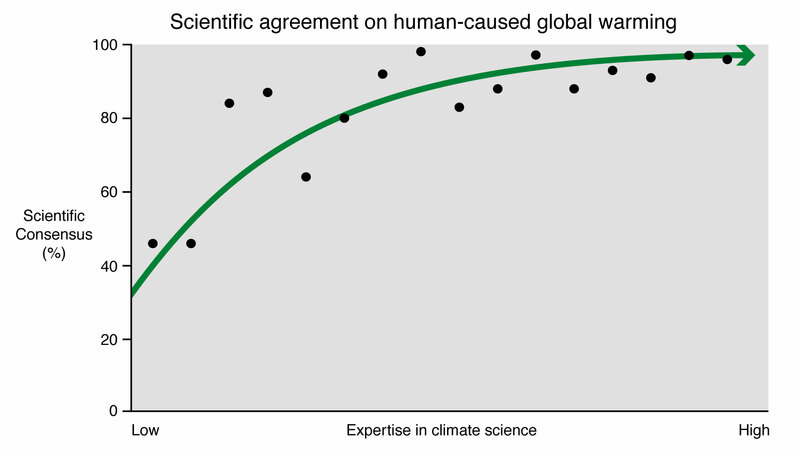 Are there actually any practicing climate scientists that disagree that there is a consensus? A climate skeptic sent me to these websites as proof that climate change is not happening and there is no scientific consensus. Help me in arguing back? For information, just use the search function on this site. You can find climate scientists that believe that smoking does not cause cancer, and that the theory of evolution is false, so I imagine you can certainly find a few that will even claim that there is no consensus. But let me get this straight... their argument is that there is no consensus on climate change, because there is no 100% consensus on whether or not there is a consensus on climate change? Do they drink from the "Drink Me" bottle or eat the "Eat Me" cake, or both, in their special little wonderland? c) It takes proper account of relevant scientific literature. The process is onerous, but it sets a very low bar. It requires you to convince just three people who know what they are talking about that the paper is not an obvious blunder. That does not show that the paper is not false, or that it is worthwhile or anything like that. Only that it probably does not contain an obvious blunder. The peer review process does not always work, either because reviewers miss obvious blunders (they are human and do make mistakes), or more frequently, because people with bizzare theories game the system by approaching an editor known to by sympathetic to their cause, who will shepherd the paper through to publication without proper peer review. Even creationist papers have been shepherded through in that way, and several "climate skeptic papers" which were obviously flawed have been shepherded through that way. In addition, a large number of papers, some by "skeptics", but many not, have been published which simply do not have the implications "skeptics" attach to them. In many cases, the supposed implications as stated by "skeptics" are directly contradicted by the paper itself, and a large number of scientists have complained about misrepresentation of their papers by "skeptics". Consequently I would take Poptech's list with a very large grain of salt. Because of this tendency of so-called "skeptics" to outright misrepresent the nature of research, many defenders of climate science including myself think a more appropriate label for them is "AGW deniers", in that they are not behaving skeptically, and because they are denying the descriptor of "skeptical" to the many climate scientists who do behave skeptically. However, the crucial point about peer reviewed publication is that it is just a first hurdle for science, and a very low one. It is, however, one that "skeptic's" arguments repeatedly come a cropper on. The simple test of convincing just three reasonably informed people that your argument does not contain obvious blunders is too difficult a challenge for most "skeptics" to meet. As a result they take their arguments to the internet, and to conventions organised by conservative think tanks, and to talk back radio shows. In other words, being unable to persuade even a few well informed people trained in scientific analysis, they take their arguments to people who are neither well informed, nor trained in scientific analysis. That shows clearly their agenda. If their agenda was the advance of knowledge, there would be no substitute for convincing the scientific community. I know of a number of controversial theories which do no have a scientific consensus, but whose adherents repeatedly try to break through the peer reviewed barrier and to convince scientists. That is because they believe their theory is true, and that truth matters. Consequently they think their theory can, and should face the most rigorous test possible. In contrast, AGW deniers have no such confidence or belief. What is important to them is not the truth of their theories, but the political effect of wide spread acceptance of their theories. They are playing a political game - not doing science. It is for that reason that (with rare exceptions) they give an uncritical pass to the egregious lies of some of their number, while straining at fleas in actual climate science. Finally, peer reviewed publication is just the first hurdle of peer review. After publication, papers are read by a very large number of scientists who can analyse the arguments and decide whether they are good, and well supported by evidence; largely irrelevant; or outright bad. The outright bad, ie, almost certainly false papers attract a small number of citations as scientist publish refutations. The irrelevant papers attract almost no citations as people ignore the paper. The good papers attract a large number of citations as people repeatedly reference the result in their own papers. Initial peer review is only a test to see if the paper contains an obvious blunder; citations are the true mark of a worthwhile paper. In that are, "skeptic papers" fare very poorly. Consensus: I think there are two important things to understand about consensus and climate change. The first and most important is that arguments about consensus are not an argument from authority, it is an argument about who is an authority. It is an unfortunate fact of life that most things that we "know" we accept on authority. It can hardly be any other way - there is simply to much to learn, and to much to analyse for anybody to have more than a passing understanding of more than a small range of topics. Even in those topics where we claim some expertise, most of what we know we know on authority because we have not done the experiments or made the observations ourselves. To give just one example, how do I know that man has ever trod on the moon? The answer is, on authority. I was not on any trip to the moon, nor part of the effort to get man there. I have not myself seen footprints on the moon. Consequently, at some level I must accept the theory that man has walked on the moon on authority. There are those who do not accept that theory, who dispute the claims of those who could actually check for themselves (such as Neil Armstrong and Buzz Aldrin). I can, and have, looked at the evidence the lunar landing deniers present, and see that their claims are unsupported. That means I can show that they do not have a reason to believe the various films of men walking on the moon are doctored, or staged. But what I can't do is prove that they were not doctored or staged because there is no in-principle limit on how well such doctoring or staging can be done. At some point I just have to trust that the films are not fakes - but when I do, I am accepting something on authority. Now, it is obviously best to rely as little on authority as you can, especially in matters of importance. In climate science, if you don't want to rely on authority at all, you first need to get yourself a PhD in physics, making sure you are well qualified in programming and statistics. You then need to read carefully around a thousand scientific papers. That's less than a quarter of all the relevant papers, but it should get you up to speed. You then need to start a major program of experimentation that will require an annual budget of millions to sustain. Even then you will need to accept the authority of various space agencies to make use of satellite data. But you will probably then be in as good a position as anyone to not rely on authority at all in your beliefs about climate change. Of course, not everyone in the population is going to do that. Indeed, only a tiny fraction of the population will undertake the limited measure or reading multiple books, about 100 scientific papers, and several excellent essays need to become, not expert, but moderately competent in understanding the arguments about global warming. Consequently, most people will have to accept most of what they believe about global warming on authority. If anybody ever tells you different, they are lying to you*. Not only are most people going to have to accept most of what they believe about global warming on authority, it is vital that most people actually have an opinion about global warming. This is because we live in a democracy, and there is not substitute for democracy as legitimate government. Given the risks involved, is is therefore vital that people have informed opinions about global warming. But to do that, they must accept much on authority. Whose authority do you accept? So called "climate change skeptics" claim that they are the authority that you should listen to. They say that they are scientists (and some of them are); and that they have studied the issue (and some of them have even done that); and the implicit claim is that you should accept them as your authority. I disagree. If you are not very well informed on a subject, and do not intend to become so, the only rational choice is to accept on authority the consensus opinion of the people who are most informed, and who have studied the issue most closely. Recently Lord Monckton described this as a "fascist point of view", but to me it is just common sense. So common that we govern our lives by it for almost every major decision, whether that be what medicines to take, and when, or what foods to consider safe. In fact, for all their posturing, the so-called "climate skeptics" recognise that this is rational approach. They recognise it by continuously portraying the actual scientific consensus as being smaller than it is; as being perhaps a small majority at most rather than the over whelming majority that it is; and portraying there numbers as being much larger than they actually are by misleading comparisons. They compare, for example, the total number of scientists involved in the IPCC (which they drastically and deceitfully understate) with a list of "scientists" by which they mean anyone with a medical or engineering degree a if that where the appropriate comparison. In fact, comparing like with like, deniers make up around 3% of actively publishing (and hence researching) scientists of any type, and just 1% of actively publishing climate scientists. But they want you to ignore the reasoning and evidence that has raised acceptance of AGW among climate scientists from around 40% two decades ago to around 97% today. The argument from consensus points out that ignoring that evidence is not a reasonable thing to do. So, while I definitely encourage anyone interested to become genuinely familiar with the science of climate change (which is fascinating in its own right), if you are not willing to do so, don't be conned into accepting a false authority by inaccurate comparisons with Galileo. * Lord Monckton actually begins his seminars by saying he will not ask anyone to accept anything on authority. He then proceeds to tell whopper after whopper secure in the knowledge that most of his audience won't check. In other words, he is banking on their accepting his authority, and the disclaimer is a sham. This is a common tactic among deniers, and is equivalent to the "cockroach trap" mail order scam. In that scam a cockroach trap is advertised with a money back guarantee. It turns out the "trap" is just two bricks and instructions to bang them together with the cockroach between. The business is legit in that the money is give back to those who apply, but the scammers make a fortune because most people don't make the effort. Sorry, forgot to cover the important thing, but two essays is enough or one day. Very briefly, it is the nature of the IPCC consensus. The positions taken by the IPCC are the position that nearly all scientists have least disagreement with. Some might disagree significantly with some points, but an equal number will disagree just as much in the opposite direction. A rough measure the level of disagreement is the statement of the likelihood of the claim (which should be paid careful attention to.) If something is considered very likely, there is very little disagreement, and those who disagree do not disagree by much. If something is "more likely than not" then there is wide disagreement, but the IPCC position is still the position from which there is least disagreement. Anyone reviewing this site that assigns a percentage for each chapter and working group of the IPCC? PS: It seems to be getting promoted out there in the Denialosphere, and has a 'score card' in which this photographer somehow rates the % of peer-review for each chapter of the IPCC report. It is nonsense. Indeed, it is OBVIOUSLY nonsense. The first massive flaw in their methodology which I noticed is that they treated every reference in the IPCC reports as a 'scientific reference' with which to dispute the IPCC claim that its scientific findings were based solely on peer reviewed research. Thus, reports on progress of various countries towards meeting the Kyoto targets, economic impact estimates, and even citations of objections from 'skeptics' (e.g. Bjorn Lomborg's book 'Global Crises, Global Solutions') are counted against the IPCC's 'score'. In short, no effort whatsoever was made to review WHAT the citation referred to in the text or whether it had anything to do with the case for AGW. The second ridiculous flaw is that their determination of whether something was peer-reviewed or not was entirely based on whether an obvious scientific journal was cited in the reference. Thus, for instance, dozens of references citing "Cambridge University Press" were marked as NOT peer reviewed... demonstrating that no attempt whatsoever was made to track down any of these papers - which appeared in the multiple peer reviewed academic journals which Cambridge publishes. Ditto various other major universities. Ditto anything in the references which people with no apparent knowledge of academic publishing did not immediately recognize as a peer reviewed journal. In short, the 'grades' they present do NOT measure the accuracy of the IPCC's claim that its scientific findings are based on peer reviewed research. Rather, they are measuring the percentages of references on any subject in the IPCC reports which they could determine to be peer reviewed with a cursory inspection by people who don't know what they are doing. A meaningless statistic... which they get completely wrong. First, in order to get the "failing grade", the "No consensus" website has obviously had to include as "grey literature" sources as diverse as IPCC reports, the Stern Review, papers presented at academic conferences, and chapters of books by reputed academic publishing houses. While many of these sources have not been through a standard journal type peer review, there is no doubt that they have been extensively reviewed to a far more rigorous standard than would be implied by such peer review. In other words, their ideosyncratic standard of "peer reviewed" is artificially restricted, and exclude much material of the highest academic quality. Second, even with this highly artificial standard, the Working Group 1 chapters nearly all get an A, with only two falling below that standard to get a B. Based on that assessment, if they took their own measure seriously, they would not question the essential results of WG 1. Clearly they do not do that, which reveals what a hypocritical exercise they are indulging in. Three, what is entirely absent is any assessment using their standard of the work of deniers. That assessment would, of course, show the deniers work in a very poor light indeed. I'm not sure if this is the right thread for this post, but I'm asking whether there is any material addressing this new theory? It's really doing the rounds in Australia. Lastly, how do I subscribe to a thread? I'm not getting emails when someone answers me? [DB] You should be getting those now. You may have to log out of SkS and then re-log back in for the changes I made to take effect. Eclipse @366, I am not sure of the correct thread, so I'll make my response here. First I should say, what a load of tripe Douglas Cotton has produced. He persistently claims that the IPCC "assumes" values which have been measured, while asserting without measurement "facts" to be true simply on the basis that they are convenient to his theory. Like many deniers, he obviously has no idea what goes into a General Circulation Model, assuming that they have the properties of a one dimensional model, while he himself employs an unphysical model of radiative transfer, the most obvious flaw of which is that he assumes any upward transmitted radiation from the atmosphere is immediately emitted to space (whereas most of it is simply absorbed by higher levels of the atmosphere). "The IPCC models assume far too much radiation from the Earth's surface instead of convection with air molecules which do not emit photons that can be captured by CO2"
The defense consists of simply reasserting his claim, and an analogy based on a cooking pot. Of course, the IPCC (actually Kiehl and Trenberth 1997, which has since been updated with Trenberth, Fasullo and Kiehl 2008 [PDF]) based their conclusions on actual measurement. Note that the upward IR radiation is consistently greater than 400 W/m^2. (It is shown as a negative number to distinguish energy leaving from energy entering the surface. For comparison, consider these measurements of Net radiation, Q*, (Incoming shortwave plus incoming longwave minus outgoing shortwave minus outgoing longwave), latent energy, LW, and sensible heat, H.
Sensible Heat, Cotton's "conduction" does not rise above 200 W/m^2 except over a dry lake bed, and is negative for much of the time. Clearly, averaged across the twenty four hour day, and across a variety of locations, it is a much smaller component than the outgoing surface IR radiation. Khiel and Trenberth's figures where generated by taking a great number of measurements such as these, and using them together with knowledge of the proportion of the Earth's surface covered by each surface type to estimate a global figure. In contrast, Cotton's alternative estimate was made by waving his hand near a cooking pot. The difference in procedure is a true indicator of the difference in value of the two works. Well, I had to read it carefully to make sure this guy was serious and not a Poe. So many unphysical things, so little time. You might like to look also at Greenhouse theory violates 2nd Law thread too. Unfortunately, there are a great many "papers" like this around. Appinsys and icecap.us are full of them (often mutually contradictory). The question is ask is "has it been published in a peer-reviewed journal?" (and E&E doesnt count). There is a Nobel prize waiting for someone who can get humanity off the global warming hook. I'd cheer them all the way, but Cotton isn't the man. Tom wrote: "In contrast, Cotton's alternative estimate was made by waving his hand near a cooking pot." The gravitational warmth theory seems to be making the rounds these days. The idea that the Earth would heat itself through gravity in the absense of the sun boggles the mind. Especially after going to great lengths to show how the incoming solar radiation has fluctuated throuhgout history. While some people like his hand waving over the cooking pot, it does show how some scientists are placing to much emphasis on outgoing radiation effects in the atmosphere as opposed to convection. Of course, this is due to the much larger difficulty in measuring the convection effects. We heard that one over and over on the 2nd Law threads; its all due to the potential energy released by air molecules falling from the upper atmosphere. That does not rise to the level of 'theory'; call it an idea, a notion, a delusion. "some people like his hand waving over the cooking pot,"
It's easier than doing actual research. Fewer annoying things like 'data' to worry about. Eric the Red @370, which scientists are "...placing to much emphasis on outgoing radiation effects in the atmosphere as opposed to convection"? It is certainly not the mainstream climate scientists. The importance of convection as a distributor of heat has been central to the theory of the greenhouse effect since Manabe and Wetherald 1967, and is a central feature of GCMs. ...it does show how some scientists are placing to much emphasis on outgoing radiation effects in the atmosphere as opposed to convection. Evidence, please. This is mere assertion. At the same time, please reference Trenberth's energy budget, which is a careful accounting of exactly how energy is transferred, backed by actual measurements. Everything balances as measured (in/out/retained). Gee, whiz, those dang scientists really do know what they are talking about... precisely, and without simple assertions and hand waving. You can stop waving your hands now. If you are getting your numbers from Pidwirny's article on energy balance of the earth where this diagram is just a revision of Trenberth's, substituting percentages for W/m2, then I'm afraid you are reading it incorrectly. In any event your numbers are incomplete. You are only accounting for incoming radiation (340) and not the greenhouse effect (which adds additional energy to the surface that must be accounted for). Either way, how does this in any way support your original contention that "scientists are placing too much emphasis on outgoing radiation effects in the atmosphere as opposed to convection"? Or are you openly withdrawing that comment? Eric the Red @374, I am going to need a citation for that claim. I have googled several articles articles written by Pidwirny, and none of them have the figures you show. Further, as Sphaerica points out, your quoted figure was for net thermal radiation (Surface Radiation minus Back Radiation), whereas Cotton and I where clearly discussing the Surface Radiation alone. Yes, we know. That's where we looked. That site is not only in complete agreement with Trenberth, but it got its data from Trenberth. Follow the citations at the end of the article. You have greatly misinterpreted what you found there. You need to read it much, much more carefully. And where exactly in that did you get your numbers from? I don't find your particular numbers anywhere there. New reader here, more on the skeptic side but appreciative of the mostly content-centric discussions. I'm interested in a wide range of AGW related topics but don't always have the scientific background to get as far as I'd like. This thread seems as good a place as any to dive in. I was reading through this thread and an idea got brought up back a while ago about the American Physical Society starting up a published debate. In the discussion, paledriver gave some good info about the newsletter and the discussion pretty much seemed to die off. I get that the link Austerlitz posted gave an inaccurate representation of the story, but I'm still curious about the most simple piece of this issue--the quote saying, "there is a considerable presence within the scientific community of people who do not agree with the IPCC conclusion." What about this quote? Is Marque wrong? It's his opinion, but given his job and contacts, doesn't his opinion seem significant? Petroleum geologists? Yes, it would probably be accurate to say that there is a "considerable presence" of IPCC doubters within that group... though the American Association of Petroleum Geologists finally tossed their 'climate change is a sham' position in July 2007 due to protests from many members. That made them the last national scientific organization in the world to announce that humans were indeed causing global warming - though they still question how much. Climate scientists on the other hand... there is no question. The number of 'doubters' is in the single digits, both in total numbers and percentage of the field. So, sure... you can find scientists who dispute global warming science. Generally, the less it has to do with their field of research and/or the more it could impact their finances, the more likely they are to disbelieve. BTW, the fact that 'scientist doubters' exist is covered in the article above (particularly the 'Intermediate' version). The graph from the Doran study shows that less than 10% (looks like about 8%) of scientists in fields other than climatology believe that humans are NOT causing significant warming. Is 8% of the non-climatologist scientific community a "considerable presence"? Sure... but obviously tiny compared to the 77% who believe that humans ARE causing significant warming. Not to mention the 97% of actively publishing climatologists who say the same. Put another way, doubters are outnumbered 10 to 1 amongst the general scientific population and 97 to 1 amongst the experts in the field. The scientific community reference was tied to the American Physical Society newsletter article, the community is of physics scientists (see posts 76-79 in this thread for the original links). So again, here's a guy not in the Petroleum Geologists society, but head of an APS newsletter saying there's considerable presence of people in the APS who do not agree with the IPCC. And while I appreciate the response, it's a bit odd that your first thought is maybe the guy is a petroleum geologist and you follow it up by saying people who dispute global warming science generally do so not based on science but more on finances. Are you making that critique of Marque? Based on what evidence? I'm hoping for a bit more in terms of argument by evidence or reason rather than hearing people saying everything skeptics says is wrong and they only say it because of money. Given the Marque-must-be-fired theme for suggesting that there are doubters in the midst, doesn't that seem to indicate at least the possibility of an environment under which other APS members might be less than forthcoming in discussing their exact thoughts on GWS if they disagreed with the IPCC conclusions? Rickoxo, you're reading in things that aren't there. "it's a bit odd that your first thought is maybe the guy is a petroleum geologist"
I didn't say that. I listed petroleum geologists and actively publishing climatologists as the likely 'outer bounds' of the range of response which could be found within different scientific communities since I had no idea who 'Marque' was. You may also note that I ASKED what scientific community was being referred to... making your claim that I assumed one seem somewhat odd. "you follow it up by saying people who dispute global warming science generally do so not based on science but more on finances"
Given that the people most familiar with the science are least likely to dispute it and those who work in the fossil fuel industry are the most likely to do so I don't think that's an inaccurate generalization. For the record, citing statistics IS argument by evidence and reason. As to the 'maybe APS members are afraid to speak the truth' idea - I refer you again to the Doran study. It was strictly confidential and included (un-named) prominent 'skeptics'. Ergo, no reason for fear of a 'backlash'... yet still less than 10% of participants believed that humans were not causing significant warming. Ergo, it's results would seem likely to correlate fairly well to the APS membership. Rickoxo#382 "hoping for a bit more in terms of argument by evidence or reason"
"... follow it up by saying people who dispute global warming science generally do so not based on science but more on finances." Certain climate simulation models predict that the warming trend will continue, as reported through NAS, AGU, AAAS, and AMS. AAPG respects these scientific opinions but wants to add that the current climate warming projections could fall within well-documented natural variations in past climate and observed temperature data. These data do not necessarily support the maximum-case scenarios forecast in some models. AAPG supports reducing emissions from fossil fuel use as a worthy goal. (However, emission reduction has an economic cost, which must be compared to the potential environmental gain). This from an organization whose past president gave a speech detailing the two strongest motivators in the oil industry: Greed and envy. I just went and read Doran's summary of his own study, and it seems that maybe the key issue for this thread is the specific description of the consensus, not whether or not there is a consensus. The two questions Doran listed as most important and that the bulk of reporting on the survey referenced were, have temps risen since 1800 and is human activity a significant factor. A couple of thoughts. 1. Those two points aren't even close to the IPCC conclusions, so if this is your definition of consensus, it doesn't seem to represent consensus on a strong position in favor of GWS as exemplified by IPCC. Second, why did Doran pick 1800? Given that there seems to be pretty good historical evidence that Europe was pretty cold during the hundred years or so before 1800, it's potentially even less significant that temps have risen since then. Lastly, the second question said that human activity is a significant factor, but it doesn't say to what degree. I do education research, so tests for significance don't mean anywhere nearly as much as effect sizes. Even if we completely accept Doran as 100% truth, it doesn't seem to add a lot of evidence in favor of a strong, IPCC like description of what scientists agree on. I just had this argument with a buddy saying, depending on what the definition is of GWS, my bet is varying ranges of percentages of scientists would say yes or no. Given Doran's two questions, I'd say yes to both of those as well, but to quote a famous Spanish sword fighter, "I do not think that means what you think it means." If you asked me to say yes or know to the APS's restatement of their position that said, "The evidence is incontrovertible: Global warming is occurring", I sure hope that any good scientist would ask for clarification as to how the term global warming is defined and the time frame in question. Given that the APS does neither in that brief statement, I'd sure hope any good scientist would say I can't say yes to this without knowing more details. And side note, the argument about money to me seems to be that you both (CB and muon) see it as a concern for skeptics but don't seem to consider it as a potential issue for GWS folks. I don't get why it's a concern on one side and not the other? I don't want to get lost in this issue, but think about Al Gore for a sec. I'm betting folks here are a bit embarrassed by some of the stuff he's said and how far beyond science he's stepped multiple times. So why did he do it? The issue seems to be about the actual scientific evidence and conclusions being in question or not. If one believes the science is settled, they would conclude that anyone questioning it must be motivated by factors other than science since the science is settled. But if you don't start from the position that the science is settled, it's possible that folks citing "evidence" on either side could be arguing out of self-interest rather than science, a possibility at least somewhat suggested by the East Anglia e-mails. I get follow the money is a powerful strategy to use in interpreting evidence, data, research and it's a huge issue in education. Commercial publishing companies frequently come up with peer-reviewed studies demonstrating that their curriculum is great. But if the argument can't cut both ways, than it's just one more piece of an a priori determination that one side is right and the other is wrong. Rickoxo#387: "why it's a concern on one side and not the other?" d. flirting with Comment Policy violation. But why bring up former VP Gore? He is not a scientist (and comments with gratuitous Gore throw-downs violate the Comments Policy as well). Dead issue. "The issue seems to be about the actual scientific evidence and conclusions being in question or not." No, the issue that deniers continue to raise is usually over the wording of questions in the survey or the response rate to the survey. Side-show: question the science, not the survey. Apply the same skeptical microscope to the junk science being turned out by the denial industry. "a possibility at least somewhat suggested by the East Anglia e-mails"
All investigations of the email hack showed no wrong-doing on the part of the scientists in question, so that's a dead issue as well. Find the appropriate thread for continued comments -- if any are necessary. "Commercial publishing companies frequently come up with peer-reviewed studies demonstrating that their curriculum is great." Is that how textbook-buying decisions are made in your schools? In mine, there's a state board that believes humans and dinosaurs lived side by side, just like on the Flintstones. What's your point? Now go read the Comments Policy again and refrain from making unsubstantiated accusations. muon, if you don't believe it's possible for GWS scientists to be tainted by money, then there's no discussion. When you tell me it's an insult and a possible violation of site policy to even consider the possibility that scientists whose work you cite as evidence could be influenced by money, what it really tells me is that we can't have a productive discussion. If this is the nature of the responses I get asking questions here, I'll keep looking around for other places to ask questions. There's a bunch of what seems like good information on this site and whether or not you believe it, I am someone who hasn't made up their mind and is trying to find out the best evidence I can. But every time I bump into someone who won't even consider the possibility of bad faith on their side but knows it's happening on the other side, it's the strongest evidence I know of that this isn't a site about finding information, it's about preaching to the choir and having fun bashing the few new comers that show up or fighting with old trolls that stick around. I'm a grad student in education and I work among professors applying for grants every day and I apply for grants to do research. I have to watch myself on every grant application I submit that I'm being honest with my data and providing an accurate description of my work. Same goes true for conference proposals, paper submissions, everything. The second you tell me its an insult to even question the potential integrity of climate scientists is the second I get you know nothing about the research community and how it works and that you're a completely untrustworthy source of information. [DB] You will find that when you get older, age will give you perspective. One of the things you will learn, at some point at least, is that in science the work has to stand on its own merits, and also suffer the withering scrutiny of peer review. This site is devoted to examing climate science on its merits and discusses the literature in the spirit of peer-review. You will also find that those who do not have evidence on their side fall back on the tried and true attack-the-messenger model, which today consists of trying to discredit those who do the research itself. If that is indeed your bent at this time in your life, may I recommend a change of venue for you? Then the discussion of the science can continue here unabated, free from aspersions and character assassinations. What I 'believe' is just as irrelevant as what you believe. What is relevant is the evidence you produce to substantiate your argument. Thus far you've produced nothing, choosing instead to ignore the 170 denier myths factually disputed on this site and focus on some drivel about who said what. You're still in grad school and you're an expert on the ethics of the research community; you admit you have to 'watch yourself' -- and yet I (and presumably others on SkS) am completely untrustworthy. Have fun looking for other places to ask questions; no doubt you will settle on one or two that provide the answers you want to hear. No accusations of deception. Any accusations of deception, fraud, dishonesty or corruption will be deleted. This applies to both sides. Stick to the science. You may criticise a person's methods but not their motives. DB - please leave this exchange up for a while so others can see the sort of nonsense that we're getting these days. Rickoxo - can you tell me how you are supposed to get rich by falsifying data to support AGW? You would get rich by finding an alternative theory - nobel prize country. What you should know is that you get research money for finding out what is unknown, not what is known. Unless the funder is a fossil fuel company, the funder is unlikely to care whether the outcome of your research supports one theory or another. Climate science is a global enterprise, subject to the most intense scrutiny imaginable. I find the idea that the theory is supported by falsified data quite laughable. Gov. Rick Perry, just days into his campaign for the presidency, has added a new and harsher element to his rhetoric on climate science – an allegation that many researchers, in order to keep “dollars rolling into their projects,” have “manipulated” the data that underlie concerns about human-caused disruption of the earth’s climate system. Shoe is on other foot; if it fits, wear it well. I'm a professional near the same area, Rickoxo, and I understand where you're coming from re education and grant writing. Education tries very hard to approach its very human subject matter scientifically, and professional efforts like the scholarship of teaching and learning movement are evidence that it is a challenge to keep the research based in the scientific method. Don't mistake the discipline of education as a hard science. Climate science is based in observation and a well-established physical model that has a number of theories that have reached the Law stage (unlike education). Many of the attacks on the theory of AGW are not supported by those laws, and the attackers refuse to recognize it. To people unfamiliar with the science or non-scientists, especially those exposed to mass media, it looks like there is serious doubt about everything in climate science. There is actually very little doubt among climate scientists, and then only in certain areas (cloud feedback, aerosols) and only to a very limited extent. The kicker is that you, who know far, far less about climate science than working climatologists, must be forced to choose between two presentations. You sound like you want to believe the science, but you have doubts because climate scientists speak with such confidence in the face of their attackers. How could they be so confident when so many people appear to reveal holes in the theory? Look at the list of "skeptic" arguments for this site. The attackers have tried everything, over and over and over again. Every few months, the same tired and easily rebutted arguments get trotted out again and again. If no one rebuts these arguments--every one of them, down to the most ridiculous and supernatural--then climate science fails in its mission to educate the democracy. People on this site have been over the science hundreds of times, explaining patiently to both the willfully ignorant and the actual skeptically intelligent. You're in education. If someone makes an argument that is rebutted with quantified evidence and a theory based in established physics, how do educators respond? Here, we get attackers who simply ignore the rebuttal and make the same argument the next day, over and over again. When you come to this site and see the overwhelming resistance to attacks on the theory, you shouldn't read the moment a-historically. Understand that the same script has been repeating for years, with the occasional "skeptic" paper being reviewed, and a steady stream of mainstream science incorporated. Understand that most of the attacks are truly bizarre and have no foundation in established physics--indeed, many are self-contradictory in their implied physical model. Attacks that look legitimate come from people who readily accept the basics of radiative transfer. For them, it's all about the level of forcing. Those arguers are few and far between, though. Some start with the ostensible position that they are lukewarmers, but when confronted by physics they go into refusal mode. For many commenters and doubtful lurkers, this site must provide a disorienting dilemma (since we're in the education lexicon, I'll whip out transformative learning theory). It's very hard to invest yourself publicly in something and then find out you're wrong about some of the fundamentals. It takes time to work through the dilemma. Some people never do. They simply back themselves into a corner where they're forced to cast doubt on the data itself. You might be thinking that we could say the same thing for climate scientists and those who support the theory of AGW. Climate science claims to base its theory in observed data and a sound physical model. Until you're able to argue through the data and physics, you'll never be sure. You should be able to intuit, though, based on what you should know (by now as a graduate student) about the social construction of knowledge, that any real doubt would be reflected in the working scientific community. Look at the scholarship. The theory, which has been around for 150 years, is not an issue in the scholarship. Only the fine details remain. There are thousands of papers that do not directly attempt to question or confirm the theory but end up confirming it anyway. Similarly, because of the nature of the hard sciences, scientists offering "doctored" data would soon be exposed. Again, in education, theory can rest on a foundation not wholly constructed of scientifically-produced knowledge. Assessment of transformative learning, for example, is an extra large can of worms. In education, people can advance interpretations that rest on weakly-supported assumptions about human behavior. Not so for the hard sciences. Weakness in a theory is quickly rooted out and, if not corrected, made widely known within the discipline's community (and related communities). Finally, if you think that climate scientists are deliberately fudging data, then you are implicating thousands of people, all of whom must be motivated to dismiss their integrity toward their discipline and toward the greater project of human progress. There are countless examples of people in all fields of human labor doing just that for the sake of financial security. There are conditions that make such moves more and less likely. Government-supported science should be one of the "less likely" contexts, because the institutional goal is human progress and the accounting is heavily scrutinized. Privately-funded science should be one of the "more likely" contexts, because the institutional goal is the generation of capital, and the books are pried open only through the efforts of legions of lawyers and watchdogs. I'll give this one more try. First, DB, you make a huge assumption about when I get older--I'm 47. I decided to get a PhD in education after teaching and a bunch of other jobs for 25 years. Any chance at all you could see in this that you making assumptions about me could be part of the problem we seem to be having? Second, this whole thing started with me asking about the APS newsletter where one of their editors said that there was considerable presence in the scientific community of those who don't agree with the IPCC conclusions. I was attempting to do exactly what you said, discuss this piece of literature in the spirit of peer review. CBDunkerson brought up petroleum geologists and then muon brought up how money-influenced the science of petroleum geologists is. I asked if it was possible that argument cuts both ways and from that point, no one has mentioned the APS quote or the questions about the Doran survey. The only thing people are interested in talking about is me supposedly attacking climate scientists and how I don't have any evidence. I didn't come here with evidence disproving global warming. I'm not a climate science like I said from the beginning. I've read quite a bit critical of GWS and came here to see what discussion I could find that presented an alternative perspective. The consensus topic was one I was intrigued by and one that requires little scientific expertise, so it seemed like a good place to start. [DB] I withdraw that portion of my comment possibly ascribing your position due to perceived youth on your part. My apologies. The remainder, including the various guidance to focus on the science & to avoid ideological assignations and aspersions, remains. If you can adhere to the Comments Policy here, then there will be no problems. Rickoxo, in the kindest possible way, think about what you were trying to say by suggesting the possibility that the science has been twisted by people in it for the money. For that to be true, many thousands of scientists over the course of more than a century, and particularly all those sice the 1930s-1950s work of Plass and Callender would have to be twisting their work, all in the same direction, all for a little more grant money (which often does not contribute directly to salary). Does that sound likely? The basic science is much older than the politicisation of the issue. Yet in all that time, nobody has managed to come up with an internally consistent un-twisted view of atmospheric physics and palaeoclimate that fits the evidence, despite the great rewards that would be on offer for such an academic achievement! The theory (note I say theory, like gravity or evolution, rather than hypothesis) of climate is based on many decade of work by thousands of people, each of whom would love to have proved their predecessors wrong, but each of whom have failed to do so, but whose evidence has confirmed and strengthened the theory. This site is awash with the products of their work. On top of that, there is a strong financial motive (billions of dollars in whatever currency) for the organisations responsible for supplying us all with carbon-based fuels to continue to do so for as long as possible. Can you think of circumstances where billion-dollar incentives have got in the way of ethical thinking or driven industries to be economical with the truth? DSL and scaddenp, thanks for the responses and I'm terribly sorry if somehow I came across as saying that climate scientists are intentionally, fraudulently doctoring their data. I sure don't think I said that and I don't think that. The point I was trying to make was the general principle that funding can influence research. The farthest far extreme is deliberate intentional fraud and that is exceptionally rare. On the other end are the legitimate things researchers do every day in trying to frame and present their research (or proposals to get grants) in a light that makes it sound as compatible and supportive of the goals of the granting organization as possible. In between those two are a whole host of options and possibilities. One that happens in education frequently is setting up an experiment so that I collect actual data that simply proves what I set out to prove. It's real data, no fudging, no fraud, but I set up the experiment such that I was pretty likely to get the outcome I wanted to get. Skeptics could use this strategy easily to "disprove" warming by collecting data from locations they have reason to believe would support their argument of no warming. No one falsified data, but the data itself doesn't tell us much. Can you imagine it being possible that researchers could design experiments or data collection strategies such that they increased the likelihood of getting data they wanted to find? Take something like arctic ice melting. Skeptics and GWS folks have conducted studies saying ice is growing and ice is shrinking. Both have what I believe to be legitimate data. It would be easy for either side to select sites to support their data collection. Whether or not that gets called out has a lot to do with the broader community of scientists in which the research is conducted. There's a lot of bad research on phonics instruction for early reading right now, mainly because phonics instruction had to fight through years of bad research to get its place in the forefront of educational practice and now many folks are unwilling to critique any phonics research for fear it will reignite the reading wars once again. Please don't read this as me saying that all climate science researchers are faking data and that now I'm adding in the entire climate science community is complicit in the coverup. Not all research is equivalently useful and valid (even if it's not fraud) and no research community is perfect at policing everything that gets produced by its members. And please, if you think you're hearing anything in what I'm saying as an underhanded sneak attack on climate scientists, I'm starting with education researchers of whom I am one (grammar? :-) and I believe this to be true of researchers in general, as a general principle. Scaddenp, in response to your question, there are a range of "payoffs" in academia other than getting rich. Getting tenure, getting conference proposals accepted, getting published, getting grants to conduct research, getting hired at a specific university, none of these get one rich, but all of these influence how researchers conduct themselves. Because I come from a balanced literacy perspective, there are universities I could never work at and journals I could never get published in. Making choices about what I choose to research, the types of data I try to find, the conclusions I draw from the data I collect, all of this has huge implications for my future. It's not just about getting rich. [DB] Well-spoken and much clearer; thanks for taking the time to add clarity to your position. Skywatcher, sorry, I would have responded to you too, but your post came in as I was writing this last one. I'm betting there is much science in climate science that is as you describe it. No way it could be faked, years and years of confirmation, pretty much absolute clarity. I don't question that at all. I don't know enough about climate science to know where that line ends and we move into theory, conjecture and debate over inconclusive evidence. I'm pretty sure from what I've read that CO2 is a greenhouse gas and when studied in a lab setting causes warming, that doesn't seem to be debated. That it causes warming in our climate, I'm pretty sure about that too. How much warming it causes and how much other factors influence and affect what CO2 does and how strongly it does it doesn't hit me as the same kind of settled science But, I'm clearly not an expert about even that statement and that's some of what I'm hear to find out. Skywatcher, sorry, I would have responded to you too, but your post came in as I was writing this last one. I'm going to avoid the question about money and research because it seems to get me in trouble and stick with the development of scientific knowledge. I'm betting there is much science in climate science that is as you describe it. No way it could be faked, years and years of confirmation, pretty much absolute clarity, like basic Newtonian physics. I don't question that at all. I don't know enough about climate science to know where that line ends and we move into theory, conjecture and debate over inconclusive evidence. I'm pretty sure from what I've read that CO2 is a greenhouse gas and when studied in a lab setting, it causes warming, that doesn't seem to be debated. That it causes warming in our climate, I'm pretty sure about that too. How much warming it causes and how much other factors influence and affect what CO2 does and how strongly it does it doesn't hit me as the same kind of settled science. But, I'm clearly not an expert about even that statement and that's some of what I'm here to find out. But think about something like, what the climate of the earth will be like 100 years from now? I can't imagine you're saying that climate predictions 100 years into the future are the kind of settled science like basic Newtonian physics? Estimations of the effects of predicted global warming on polar bear populations? Settled? In areas where the science isn't settled and the evidence is inconclusive, education researchers, sociology researchers, economists, politicians and even hard scientists are influenced by a host of factors as they make research decisions. It's not unique to any community nor is any community immune to it. This brings up a couple of great questions that hit me as critical to the larger GWS debate. 1. What are the clearest, simplest, most accessible and most incontrovertible facts that support GWS? (i.e. oceans are warming, ice is melting, etc.) 2. What is the proof that these facts are caused by people and are not natural? I get that's what this site is all about, but there's a great strategy in argument that says present the simplest, cleanest, most irrefutable point that supports your position first and start there. When people tell me there are hundred of threads and tons of articles discounting every skeptic argument, that doesn't help as much as here is the best piece of evidence available demonstrating human influence on the climate. I would love to know that about GWS science if it exists. Sometimes, in education, politics, philosophy and science, this one shining example doesn't exist and there's no "easy" way in to helping someone shift their perspective. But I offer you that if this site could put its considerable energy into thinking through the simplest, clearest and most irrefutable evidence support AGW, it would be a huge benefit to the independent community, attempting to choose between two presentations of alternate perspectives. Rickoxo "I can't imagine you're saying that climate predictions 100 years into the future are the kind of settled science like basic Newtonian physics?" Me? I'd say it is (see later) - unless you think that a double pendulum violates Newtonian physics. Later. The real uncertainties in climate 100 years hence relate to the things we cannot yet know. The main ones being - things we do - exactly how much CO2 will be emitted in what timeframe, and how much CO2 will be extracted from the ocean/atmosphere by deliberate action. Things we cannot possibly know with any reliability - when will icesheets slide into the sea given persistence of any given temperature rise, when will methane from its many available sources release and how fast, when will the oceans/land become net sources rather than sinks of CO2. We know they will happen in high temperature conditions. We just don't know whether it might be decades rather than centuries or millennia for any, some, many of the worst effects to kick in. But what about things like volcanoes, tectonics, solar activity? All of those things (and I'm guessing others as well) can significantly affect climate and are basically impossible to predict, no? How many of the factors that significantly affect long term climate trends are predictable 100 years into the future? 50 years into the future? So would there be the kind of Doran (2009) consensus on what the climate will look like in 100 years? Or would there be more of a spread out distribution of predictions? Is your point the consensus would be stronger on the types of things that would happen (i.e. ice sheets melting) if climate goes up x degrees? And to restate the question I'd like to talk about, Doran (2009), a survey of 3000+ scientists with questions about global warming science, describes what he calls the two main questions: have temps warmed since 1800's and has human activity played a significant role? Questions about consensus have everything to do with the statement in question. Has the planet warmed since 1800, I don't know too many folks who would argue with that. Picking 1800 seems a bit odd since from what little I know Europe was going through the little ice age so it seems likely that temps have risen since then. Asking about has human activity had a significant impact is the wrong question. Questions of statistical significance don't say anything about effect size or interactions, both of which are the more critical issues. So the Doran (2009) 90%+ consensus only affirms that the planet has warmed since 1800 and that human activity has played a significant part. That to me does not equate at all to a statement like, the science of AGW is settled or concluding that the same percentages of scientists would agree with IPCC 2007 conclusions. Am I missing something or is the Doran (2009) study not that significant of a piece of evidence in favor of the consensus position? Btw, can anyone provide a link to something bigger than the two page summary I keep finding? I've googled and followed every link I can including using my university account to search published research and I can't find the original study. I'd mainly like to see all of the survey questions that were asked and the results for all of them. Thanks for any help. Hi Rickoxo, thanks for your clear explanation of where you're coming from. I'll try and tackle one or two points. On ice, there's not much ice at all that is growing. The ice sheets of Greenland and Antarctica are both showing overall retreat (Greenland in particular), and the vast majority of mountain glaciers are retreating. Global sea ice area, and most especially Northern Hemisphere sea ice area, is also shrinking. See the various relevant links around the site. The only ice that shows any increase is Antarctic sea ice, and there are dynamical reasons as to why that behaves very differently to Arctic sea ice. Do you know which ice you thought was increasing, and what the source was? Future climate is all about boundaries, a little like predicting the weather next summer on a winter's day. I can't tell you that midsummer's day will be exactly 25C, or 18C or whatever, but I can say confidently that it will be considerably warmer than the 7C winter's day I'm experiencing, because the boundaries have shifted. We know that CO2 is by a large margin the strongest forcing agent in operation at present (and still increasing in strength), and so unless our emissions decrease substantially, annual temperatures by the end of the century will definitely be a lot warmer than now. We can't say with certainty if the temperature in 2100AD will be exactly 2C, 4C or 6C warmer than temperatures today, because that depends on the overall emissions between now and then. With a particular emissions scenario (say one producing 3C warming by 2100), the variability of ENSO, volcanic and solar may make 2100 individual year slightly warmer or slightly cooler than 3C (+/- up to 1C). The overall emissions act like the warming between winter, spring and summer, and the additional forcings of ENSO, volcanic and solar act like the weather on a particular summer's day. We don't need to know the exact values of ENSO, volcanic* and solar** to know that it will be warmer 90 years from now if we keep emitting prodigious amounts of CO2 into the atmosphere. *all this assumes there will be no supervolcano eruption which would have a large magnitude impact. **even a Maunder Minimum-like period of solar activity would only slow warming a little by introducing a depression of something like 0.3C to the rise in temperature. Rickoxo#401: "Am I missing something"
You've questioned whether the science is settled and seem to feel a single paper, in this case Doran, is the only thing of interest. It is not; look at any number of threads here that (taken together) reference and review thousands of published articles. Evaluate the actual evidence presented, not the surveys. If you are looking for a demonstration of consensus, go around to the websites of various professional organizations in the related sciences. Read their position statements on climate change; discount overt ringers like the one I cited for AAPG (even though they state out loud that climate change is occurring and tacitly that reducing CO2 will have an impact). But it seems that those who talk about consensus are often really talking as if that requires 100% agreement -- and the existence of one genuine skeptic out there results in another 'Ha! There's no consensus.' 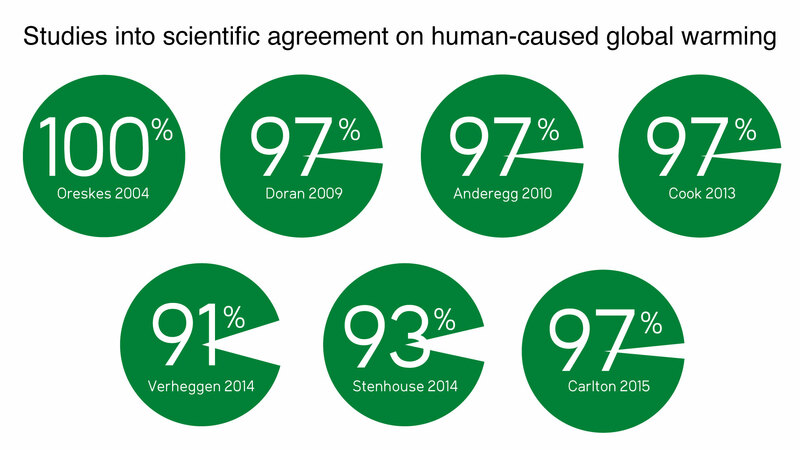 That's utterly incorrect: scientific consensus is never 100%. Accepting that fact, I suppose you can worry about how many dissenters it might take to 'break' the consensus. Once again, that's silly; especially when we read just how weak the case of some of these 'skeptics' turns out to be. Quoting their talking points, rather than analyzing their substance, reduces the discussion to the level of many other climate blogs and that is not what we're about. No, consensus is obtained by the weight of the evidence -- and the quality of the work done by those who assemble it. There will always be someone in the background shouting 'but it could be ___'; that does not alter the evidence in any way whatsoever. When you speak of the science is settled, its the weight of the evidence that settles it. Rickoxo, it seems like you've mostly left 'consensus' behind and are now getting into questions about solar forcings (much smaller than current CO2 forcings and feedbacks), volcanoes (major eruptions cause cooling for only a couple of years), plate tectonics (can significantly impact climate, but only over timespans of millions of years), ice (the total amount and the vast majority of individual locations is in accelerating retreat worldwide, a comparative handful of locations show small increases), and so forth. My suggestion would be to read the many resources on this site which already cover all of those issues and THEN ask questions on the appropriate pages.